Sultan Ghari tomb lies about 6 km west of the Qutb Minar in Delhi, India and is actually a Vedic Hindu temple. Sultan Ghari (Hindi: सुल्तान ग़ारी, Urdu: سلطان غاری‎) was the first Islamic Mausoleum (tomb) believed to be built in 1231 AD for Prince Nasiru’d-Din Mahmud, eldest son of Iltumish (of the Slave Dynasty), in the “funerary landscape of Delhi” in the Malakapur village (near Vasant Kunj). But the sanskrit inscriptions on ceiling and engraved symbols of animals on a lintel prove that this was originally a hindu temple which was later demolished partially and a tomb was made to appear on it. Prince Nasiru’d-Din Mahmud was the uncrowned son of sultan Iltmash, who was the 3rd king from slave dynasty which rules Delhi from 1210 to 1236 AD. The Slave Dynasty ruled Delhi during the period 1206 to 1290. Iltumish invaded eastern part of India in 1225 AD to capture Lakhnauti (now a ruined city in West Bengal named Gaur). This battle ended in signing of a treaty between Iwaz Khalji, ruler of Eastern India (Bihar and Bengal) and Iltumish. Iwaz agreed to pay a surety of 80 lakh tankas (silver currency), 38 elephants, mint and issue of coins in the name of Iltumish and accepting Sultan’s suzerainty over the region. Before returning to Delhi, Iltumish divided the region into Bihar and Lakhnauti, and installed Alauddin Masud Jani as his feudatory in Lakhnauti. But Masud Jani’s control was short lived as he was overthrown by Iwaz soon after Iltumish’s departure. Iltutmish, then deputed his eldest son prince Nasiru’d-Din Mahmud to fight Iwaz. In the battle which took place near Lakhnauti, Iwaz was trounced and executed in 1227 AD, along with his nobles. Prince Nasiru’d-Din Mahmud, was then appointed as governor of Lakhnauti province, and he merged his original province of Oudh with Bengal and Bihar, and established his capital at Lakhnauti. This act of his coupled with the fact that he was son of Iltumish enhanced his prestige in the province. As a reward, he was given the honorific title of ‘Malik-us-Sharq‘ (king of the East) by Iltutmish. His rule was short lived, eventful but he could consolidate his territory. After a rule of 18 months, Nasiru’d-Din Mahmud was killed in 1229 AD. Immensely grieved by the death of his favourite eldest son, Iltumish built a tomb called the Sultan Ghari Tomb in memory of his son, in 1231 AD, close to the Qutb complex. Surprisingly, it is called as Sultan’s Tomb in general but not on name of any particular king or prince. Five years later, Iltumish died in 1236 and his tomb can be seen in the Qutb complex. 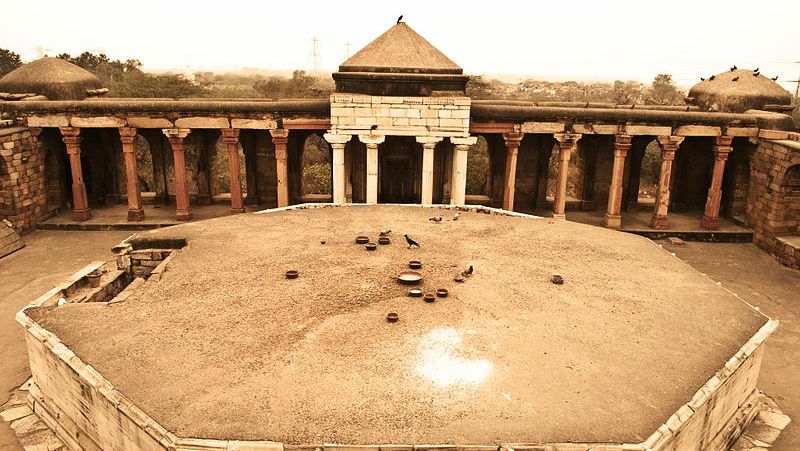 His two other sons, Ruknuddin Feroze Shah (died 1237 AD, after he was deposed) and Muizzudin Bahram Shah (was killed in 1241 AD) who ruled for short periods, before and after their famous sister Razia Sultana ruled Delhi, were also buried in separate Chhatris (cenotaphs), just next to the Sultan Ghari. One of the two Chhatris is restored while the other has been destroyed later. Archeological Survey of India (ASI) found a stone Siva Linga, carvings of a Wild Boar (Pig) and Cow on a lintel and sanskrit inscriptions on ceiling but these were never given importance in finding out ‘real‘ history of this demolished temple. Beams of the octagonal crypt bore figures of Kamadhenu (celestial cow) and Varaha (Lord Vishnu’s incarnation as a wild boar) and a Muslim tomb would never have these two highly detested animals. Modern Indian Archaeologists try to justify them as that the building must have been built out of the debris of some Hindu buildings, or that the workmen, being Hindu, built in the Hindu style. All these arguments are false as Islamic conscience cannot tolerate carvings of animals (that too Pig) in their buildings. Due to negligence, ‘real‘ history of this ancient Vaishnava temple could not be known.